So Lucky is about a woman, Mara, realising that she needs a community—other disabled people—that for her doesn’t exist yet. It’s about how she finds her people and then begins to discover and help shape a new culture. “I need it, so I’ll have to build it” is where the queer community began in the 60s and the feminist community in the 70s. Both accelerated in the 80s. The HIV+ community did it in the 80s and 90s. The disabled community are doing right now. Having no established community to lean on in times of need is terrible; it is alienating, Othering, and enraging. Finally finding your people and beginning to create a life, a history, a path, plan, and sense of purpose together, though? That is blazing joy. So few people get to be part of the building blocks of a culture. So many of us are born into a sense of belonging and history, and never get to really find out our own perspective on the world. We might change part of the way through our lives, but, generally speaking, any path we may follow is already well-trodden, ready-made and lined with relevant music, books, films, fashions, and documentary history. But when you get to build the art and culture that doesn’t already exist, the art you create is fuelled by the emotional journey: the alienation and the homecoming, the fear and excitement, the rage and joy. It is rich with the delight of discovery, of making, of connection; the warmth of belonging and building your own hearth. But there’s always the thread of dissonance running through the whole, the sense that the world you’re conjuring is fragile, and that monsters lurk just outside the warmth. In the UK in the 80s the lesbian feminist community went through this. It was an incredible time; the music and art that flowered from it is part of what made me (and certainly made my music: I fronted a band, Janes Plane). The sense of breaking rules—political, legal, social expectations of good behaviour—made our lives feel sui generis. So when I began to write about a woman entering a different phase of life as newly disabled, I reached for that sense of DIY culture. It helped that I’d already been thinking about this music as part of my participation in the Visible Girls project (and now the new Visible Girls: Revisited exhibition put together 36 years after the original). I’d already begun to put together a playlist. This music is what I played, and added to, while writing So Lucky. Music of another culture’s flowering nearly 40 years ago seemed to fit. To hear a woman singing about instant lust for another woman unshrouded by polite formulations of love and hearts and flowers was exhilarating. I listened to this a lot when I was wasted on hash. I never really paid attention to the lyrics, but listening now the song strikes me as about the hypocrisy of western attitudes to weed, a commentary on cultural appropriation and misogyny. But that’s secondary. The importance to me was the sound. I saw John Martyn live in 1980: just him, solo, on stage. He was dazzling. Again, this is a song about drugs, and the smooth, lubricated distance from reality you can achieve while still trying to get away, break free from a harmful habit and old ways of behaviour. Why this one? I don’t know, exactly. Some combination of group journey, becoming conscious, taking change into one’s own hands and leaving the old ways for better ways (again). It has a driving sense of movement: unhurried, unstoppable, implacable. This is a sly cultural mashup and reminds me of my own brief musical career. Roland Gift (later of the Fine Young Cannibals) played sax for the Akrylykz and then formed his own band, the Righteous Brothers (really). My band, Janes Plane, supported them once. What I love about this song is how the sinister, droning bassline turns a Marvin Gaye song into a threat. Perfect for So Lucky which is ripe with threat. There are so many UB40 songs (UB40 is the name of the card unemployed people had to carry to sign on for their fortnightly welfare assistance; I had one) I could use. This one, sadly, could have been written recently for the #BlackLivesMatter movement. It speaks to the rage against the mortal danger of systemic oppression, which of course is something Mara, the narrator of So Lucky, is beginning to encounter for the first time. The shape and spine of this song is emblematic of the new music women were making. Instead of the driving heart of the piece being two men on bass and drums, it is two women: a fat-sounding, relaxed but authoratative bass balanced by politically and melodically powerful lyric and vocals. This is an almost perfect exemplar of music that came from queer northern female experience, performed, recorded, and distributed by women. FLB offer a working-class queer female perspective in the kind of close harmony so common to embattled and Othered communities. Shared music is one of the fastest and surest ways to build group cohesion—ask any religious congregation—and the brilliant flashes of humour here are common, again, to communities used to being misunderstood. Anderson was the Tilda Swinton of the 80s art world: alien enough for her audience to feel as though she has something to say to those who don’t belong, cool enough to be admired by everyone else, and surreal enough to remain intriguing. So much of what Mara goes through feels surreal but I wanted the text to be hyper real and precisely engineered with absolutely nothing wasted; and very clear, very pointed, calling out what is. Very Laurie Anderson, in other words. This song was a favourite during my snorting amphetamine years. It reminds me of Mara’s favourite drug, modafinil, which is just a smooth, high-tech (and legal) version of speed: it keeps you going, going, going. This song is one of the best musical expressions of relief, joy and freedom I have ever heard. It’s about stepping into another life, to begin again, remade, to move ahead under your own control and go your own way. It is a song about finally stepping out from under the burden of others’ control and others’ demands and expectations. This song is on almost every playlist I have ever built. I know this song is not about disability, but even if I’d tried, I could not have written a better song for So Lucky: “They cut off my voices so I grew two voices.” Yes. One has to be indomitable because it’s that or die. Find your voice and cry into the void, find your people, and be heard. Community is strength. Community is life. 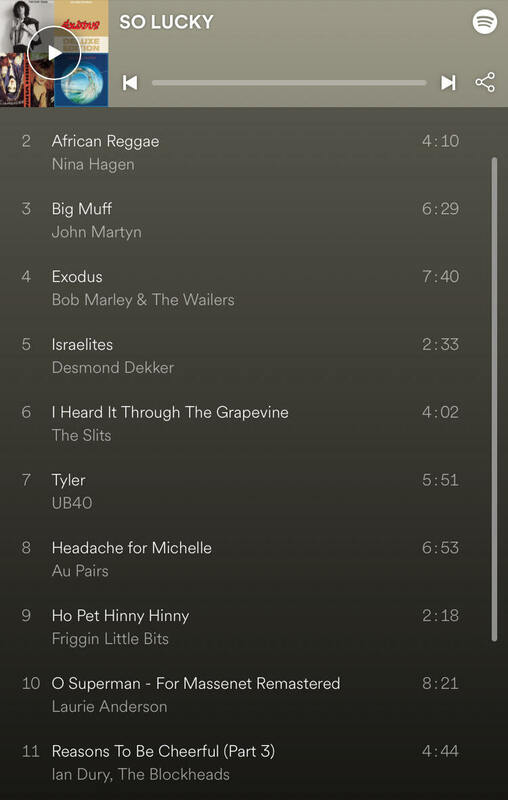 If the embed code at the top of the post is screwed up, you can listen to this playlist on Spotify. This playlist will appear on www.powells.com on June 5, 2018. Oh my god, someone else wwho remembers the FLBs! I loved the one about her mother coming to stay…but Ho Pet Hinny is so vicious, and so accurate, that I’ve been singing it on and off since the 90s. @2:55 I’m crap at remembering lyrics (I even forgot some of my own) but FLB I remember! Well said. Thank you for sharing your playlist and the many voices that contributed to your inspirational landscape for this!